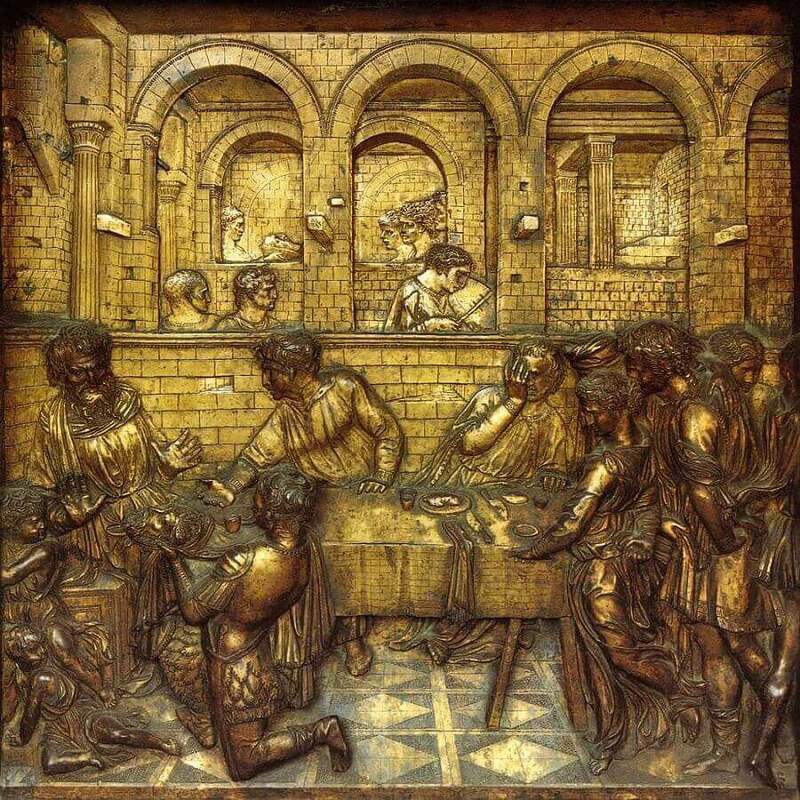 Donatello produced his first bronze relief sculpture, The Feast of Herod, in c. 1427 for the baptistery of Siena Cathedral in Italy. Noted for its pioneering use of perspective, the sculpture, measuring just 60 by 60 centimetres, depicts the beheading of John the Baptist after Salome has asked Herod Antipas for his head on a platter. In the scene, an executioner presents the severed head and Herod reacts in shock. In 1416, Lorenzo Ghiberti was invited by the Siena Cathedral officials to work as an advisor and designer for the commission of a new baptismal font. According to the original plans, the six relief sculptures, which were to adorn the sides of the hexagonal font, were to be completed by Ghiberti and two local Sienese artists. Donatello's The Feast of Herod relief was added to replace one of the reliefs of Jacopo della Quercia, an artist involved in the project, who had fallen behind the schedule. The transfer of this commission and the commencement of Donatello's work on the project, took place in 1423, when an initial advance payment for the relief was made to Donatello. The final payment to Donatello was made in 1427 when the finished relief was collected from Donatello's workshop in Florence and transported to Siena. The original commission specified that the depicted scene should be the moment "as the head of St. John was brought to the table of the king," which Donatello expanded into the scene now known as The Feast of Herod. In earlier depictions, such as Andrea Pisano's reliefs on the South Doors of the Florence Baptistery (1330-1336), Salome's dance, the beheading of St. John, and the presentation of the head to King Herod, were separated into different scenes. Donatello brings these elements together, using continuous narrative to illustrate the scene and portray John's martyrdom without explicitly showing the gory details of the beheading. Another way that Donatello's work differs from previous representations is the emotional expressiveness of the figures, as Herod and his companions physically recoil from the brutality of the severed head, encouraging us, the viewer, to also become involved with the scene. The addition of architectural elements allows for the incorporation of linear perspective to the scene, heightening a focus to the narrative points and figures. Donatello was inspired by Brunelleschi's exploration into a linear perspective system involving orthogonals (diagonal lines that meet at a central vanishing point) and transversals (the lines crossing these orthogonals) that work together to draw the eye to the vanishing point and create an illusion of space on a two-dimensional surface. The sculptor manipulates this device by having the focal point lead to a 'V of open space, encouraging the eye to move across the panel to the two separate groupings, rather than focusing on one single element. The inclusion of linear perspective would later become a standard element in Renaissance painting and sculpture, after being described by Leon Battista Alberti in his 1435 treatise Delia Pictura. Once again, Donatello's art is ahead of its time.